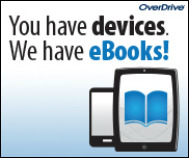 Ebooks are available 24/7/365 using OverDrive. Check it out! Search books in our media center. Don't know what to read next? Check out NoveList Plus for suggestions. ​Click here for a list of database passwords. MOBIUS-A consortium of academic/public/special libraries with 71 members. The Consortium's purpose is to share materials, information, and services.